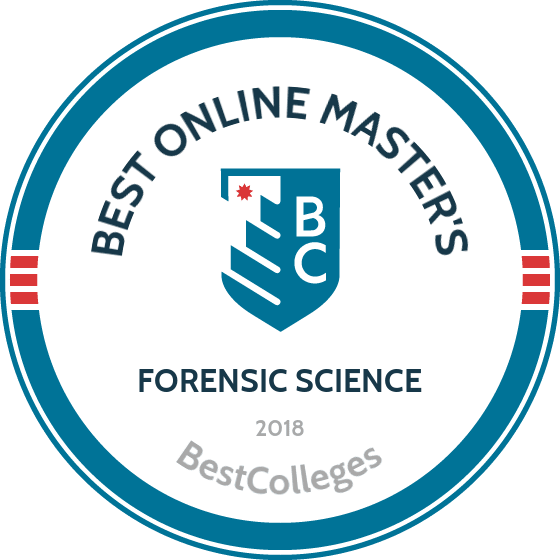 What Are The Best Online Master's in Forensic Science Programs? What Else can I Expect from an Online Master's in Forensic Science Program? Forensic science is a field that benefits from rapid developments in technology, leading to growth in specialty areas like computer forensics. In fact, forensic science technician is one of the fastest growing occupations in the United States, according to the U.S Bureau of Labor Statistics. If you are considering a career in forensics, an online forensic science master's degree may help find your niche in this expanding field. As the state's flagship university, the University of Florida boasts enough resources to offer a large selection of distance education graduate programs. Those resources extend to the school's 32-credit online forensic science master's degree. The program usually takes about two or three years to complete and includes four specialties: forensic science, forensic DNA and serology, forensic toxicology, and forensic drug chemistry. Students complete 18 credits of core coursework along with 14 elective credits within their specialization. Since the program is designed for working professionals in the field, coursework is delivered asynchronously and students complete assignments at their own convenience. To allow for additional flexibility, students can enter the program in the fall, spring, or summer terms. Applicants must submit GRE scores and must have earned a bachelor's degree in a scientific field with a minimum GPA of 3.0. Orlando is home to the University of Central Florida, the school with the largest undergraduate enrollment in the nation. UCF also offers a wide range of graduate distance education programs, including the online forensic science master's program. The degree consists of three concentrations: forensic analysis, forensic biochemistry, and forensic professional. While the first two concentrations require an original research project and a written thesis, the forensic professional concentration requires the completion of a culminating capstone experience. UCF's forensics program is highly flexible, allowing students to take coursework on a part- or full-time basis. Because of this, working forensics professionals are encouraged to apply for admission. The program also accommodates transfers credits, allowing students to complete up to six credits of advanced forensics coursework at another approved university. Graduates of the program can work as crime scene investigators, forensic scientists, or forensic psychologists. The City of Brotherly Love is home to the Philadelphia College of Osteopathic Medicine and its forensic medicine master's program, which blends face-to-face coursework with online studies. Throughout their first year at PCOM, students attend courses one weekend a month on campus. On-campus coursework covers the basic principles and pathology of forensic medicine. During their second year, students in the program take online courses in areas such as law, bioethics, and research design. Students finish the 40-credit program in exactly eight terms, or two years. PCOM's online forensic science master's program targets career changers who have a bachelor's degree in a non-science field. The school's Pathway Program in forensic medicine allows students with degrees in fields such as anthropology, business, education, and social work to take summer coursework before entering the master's program in the fall. PCOM offers the same tuition rate for all students. Located in the University Park district of Miami, Florida International University offers a variety of online and on-campus programs, including an online master's degree in forensic science. The 32-credit program operates on a hybrid model, pairing online coursework with in-person requirements. In addition to skill-building in the forensic sciences, the degree teaches students about management and organizational development. Students must also complete a capstone research internship along with hands-on forensics workshops. FIU's program was created under the Professional Science Master's (PSM) initiative, which encourages collaboration in forensic science between FIU, the University of Florida, the University of Central Florida, and other schools around the country. Classes in the program are taught synchronously using a cohort model, and the degree takes exactly 16 months to complete. FIU charges a flat-rate tuition for all students. La Salle University is a Roman Catholic school affiliated with the Archdiocese of Philadelphia. The school's master of science in economic crime forensics (ECF) program includes two tracks: corporate fraud and network security. Courses in the program cover topics such as criminal justice, financial fraud, and information security. Because of the practical nature of the degree, La Salle's online master's degree in forensic science prepares students for careers as corporate fraud auditors or network security managers. The curriculum consists of 36 to 39 credits, including a core MBA course in managerial and financial accounting. Students must complete 10 core courses, an elective, and a concluding integrative capstone. Electives include classes on white collar crime and cybercrime. All applicants to the program must have already earned a bachelor's degree — preferably in business, technology, or criminal justice — with a GPA of at least 3.0. Most students pursuing an online master's degree in forensic science will have a bachelor's in one of the natural sciences -- chemistry, biology, or physics -- although that is not always necessary. Coursework will vary between programs, but forensic science graduate education helps students develop problem-solving and analytical skills, and covers how to study crime scenes. Forensic science programs emphasize different courses based on their focus, but most have similar core courses. Below, we've highlighted a few common courses you would encounter in most programs. Crime Scene Investigation: This course trains students in techniques and procedures for properly approaching, protecting, and investigating a crime scene, and usually includes discussion of the legal and scientific principles of crime scene searches and seizures. Forensic Biology: In addition to providing an overview of methods for characterizing body fluids and other biological materials, forensic biology trains students in advanced forensic applications of molecular biology DNA techniques, such as polymerase chain reaction. Forensic Chemistry: This course familiarizes students with advanced methods for analyzing forensic samples, like glass, fiber, paint, and explosive residues. It also may provide a background in statistical analysis of data. Forensic Psychology: This course explores the application of clinical psychology in a legal setting, covering topics like eyewitness testimony, criminal psychopathology, the insanity defense, and criminal profiling. HOW LONG DOES IT TAKE TO GET AN ONLINE MASTER'S IN FORENSIC SCIENCE? Generally, to earn an online master's degree in forensic science, you need to complete at least 32 units. This takes a full-time student approximately two years to accomplish. However, there are many factors that can affect the time needed to earn a degree. Accelerated programs often allow students to take multiple classes per semester, significantly reducing the time needed to graduate. Additionally, schools may give credit for work experience or courses completed at another institution. Students may also take classes on a part-time basis, which will lengthen your duration in school, but may be more convenient for working professionals with a full-time job. Schools using a cohort model for classes (specific class time, group learning) rather than an individual model (at your own pace) can slow down your progress if you are unable to complete a class as scheduled. The best online forensic science master's degree programs are accredited by proper regional or national bodies. Recognized accreditation of a school or program is often required to obtain tuition reimbursements, financial aid, qualify for licensing exams, or transfer credits to another institution. Accreditation means all aspects of an institution -- faculty, departments, programs, and curricula -- have been reviewed and have met the standards of the accreditation agency. Schools can be regionally or nationally accredited. Programs with national accreditation are often considerably less expensive and will accept transfer units from a wider selection of schools. However, the majority of U.S. colleges are regionally accredited, and they tend to have stricter qualifying standards. Program accreditation is also necessary to guarantee the quality and rigor of the online forensic science master's degree program that interests you. The most widely recognized accreditation body for forensic programs is the Forensic Science Education Programs Accreditation Commission (FEPAC) -- an affiliate of the American Academy of Forensic Science (AAFS). Accreditation shows that the institution and program have met rigorous standards set by the U.S. Department of Education (ED) and the Council for Higher Education Accreditation (CHEA). Both are agencies that establish and implement educational policies and standards so that schools meet the same criteria for excellence. Each agency holds schools accountable and advocates for quality education, ensuring that your degree is worth the investment. A list of all accredited schools and their agencies can be found on CHEA's website. Forensic science technicians include everything from blood splatter experts to DNA analysts. Many technicians specialize in crime scene investigation or laboratory analysis. Most forensic science technicians write reports and need good communication skills. Detectives and criminal investigators gather facts and evidence of possible crimes. While it is possible to become a police officer without a degree and work your way up to detective, most federal agencies, such as the FBI and DEA, require agents to have a degree, preferably a graduate degree. Arson investigators are usually firefighters with advanced degrees in chemistry, fire science, or forensic science. They collect and analyze evidence from scenes of fires and explosions, reconstruct the scene of a fire or arson, interview witnesses, and document and analyze evidence. Computer forensic analysts work with law enforcement agencies to retrieve information from computers and other types of data storage devices, which are often damaged or corrupted by hacking or viruses. Laboratory managers oversee the forensic staff who run the tests and analyses. They maintain equipment and ensure that staff members follow safety regulations and operational protocols. An advanced degree is usually required for this supervisory position. A number of factors determine what you'll earn as a forensic scientist, such as the which industry you work in and your education and experience levels. Private industry tends to pay higher salaries than nonprofit employers. Employees with graduate degrees tend to earn higher salaries. Nevertheless, you can expect to make more the longer you stay in a position and gain valuable experience. The following table uses data from the U.S. Bureau of Labor Statistics to illustrate the typical salary arc of a forensic scientist based on industry. Paying for an education is a concern all students have, and the first step to figuring out how much you can afford is to complete a Free Application for Federal Student Aid (FAFSA). Students who complete the FAFSA and meet the general eligibility criteria receive a federal aid package that is an assortment of loans, grants, and scholarships. If you work full-time, you should also consider contacting your human resources department as well. Many companies offer tuition reimbursement in their benefits package as a way to attract and retain talented employees.